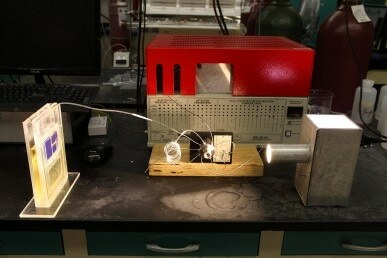 A new, innovative solar cell that can convert carbon dioxide from the atmosphere into usable hydrocarbon fuel has been developed by scientists at the University of Illinois, Chicago. The efficient and affordable solar cell uses only solar energy for the conversion. The research was financially supported by the U.S. Department of Energy and the National Science Foundation, and the results have been published in the July 29, 2016, issue of the journal Science. An application for a provisional patent has also been filed. Traditional solar cells harness sunlight and convert it into electricity that is then stored in batteries. The new solar cell performs the function of plants by directly producing fuel from atmospheric carbon dioxide, simultaneously eliminating two major problems. A plant full of these “artificial leaves” can efficiently produce energy-dense fuel by extracting large amounts of carbon dioxide from the atmosphere. The new solar cell is not photovoltaic — it’s photosynthetic. Instead of producing energy in an unsustainable one-way route from fossil fuels to greenhouse gas, we can now reverse the process and recycle atmospheric carbon into fuel using sunlight. Unlike plants that generate fuel in the form of sugar, the artificial leaf produces synthetic gas. This synthetic gas, also known as syngas, is a combination of carbon monoxide and hydrogen gas. The gas can be converted into hydrocarbon fuels, such as diesel, or can be directly burned. The potential to convert carbon dioxide into fuel at an expense comparable to a gallon of gasoline would completely deplete the fossil fuels. Carbon dioxide can be converted into a flammable form of carbon using chemical reactions know as reduction reactions, which are the opposite of combustion and oxidation. Although scientists have tried to find catalysts that can enable carbon dioxide reduction, their methods depend on expensive metals such as silver and have not been fruitful, said Salehi-Khojin. Salehi-Khojin and team used transition metal dichalcogenides (TMDCs), a group of nano-structured compounds, for the conversion. They united the TMDCs with an unorthodox iconic fluid, in the place of an electrolyte, in three-electrode electrochemical cells with two compartments. Out of the numerous catalysts that the team explored the nanoflake tungsten diselenide was shown to be the best. “The new catalyst is more active; more able to break carbon dioxide’s chemical bonds,” said first author of the paper, Mohammad Asadi, who is a postdoctoral researcher at UIC. Asadi also stated that nanoflake tungsten diselenide is 20 times cheaper and 1000 times quicker than catalysts made of precious metals. TMDC catalysts have been used by other scientists in other methods to produce hydrogen, but the catalyst was not able to survive the reaction. “The active sites of the catalyst get poisoned and oxidized,” Salehi-Khojin said. The innovation by the team involved using water mixed with the iconic liquid thyl-methyl-imidazolium tetrafluoroborate, in equal parts. The combination of water and the ionic liquid makes a co-catalyst that preserves the catalyst’s active sites under the harsh reduction reaction conditions. The artificial leaf developed by UIC scientists harvest sunlight using two silicon triple-junction photovoltaic cells which measure 18 cm2, each. The device also consists of the ionic liquid and tungsten diselenide co-catalyst system on the cathode side and on the anode side, cobalt oxide in potassium phosphate electrolyte. When the cell receives sunlight at 100 W/m2, which is the average intensity of light received by Earth, carbon monoxide and hydrogen are produced in the cathode side while free hydrogen and oxygen ions are produced in the anode side. Salehi-Khojin said that the method must be adapted for both large and small scale use, in solar farms and applications. He also added that in the years to come the technology may also be used in mars, whose atmosphere contains large amounts of carbon dioxide, if water is found in its surface. This work has benefitted from the significant history of NSF support for basic research that feeds directly into valuable technologies and engineering achievements. The results nicely meld experimental and computational studies to obtain new insight into the unique electronic properties of transition metal dichalcogenides. The research team has combined this mechanistic insight with some clever electrochemical engineering to make significant progress in one of the grand-challenge areas of catalysis as related to energy conversion and the environment.